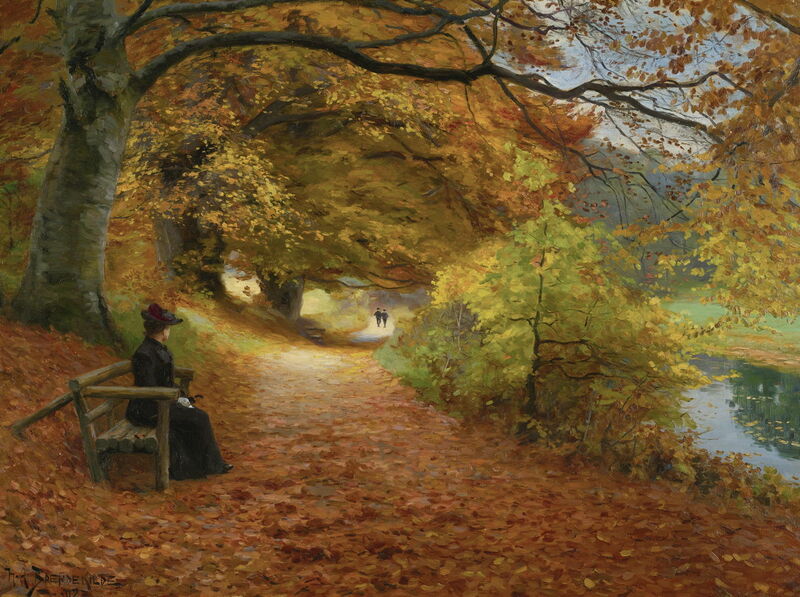 We know that the two Danish Naturalist artists Hans Andersen Brendekilde (1857–1942) and L A Ring had painted together in a village near Odense in 1893, and their friendship seems to have extended well beyond that. However, Brendekilde’s accessible paintings and biography then become relatively thin. He seems to have travelled quite often: in 1894-95 to Germany and Italy, and several later trips to Italy again. But I haven’t been able to find any of his paintings showing scenes outside his native Denmark which correspond with those periods abroad. Those works which are accessible now consist of mostly rural genre scenes and religious narratives. Hans Andersen Brendekilde (1857–1942), Melting Snow (1895), oil on canvas, 108 × 124 cm, Fyns Kunstmuseum, Odense, Denmark. Wikimedia Commons. 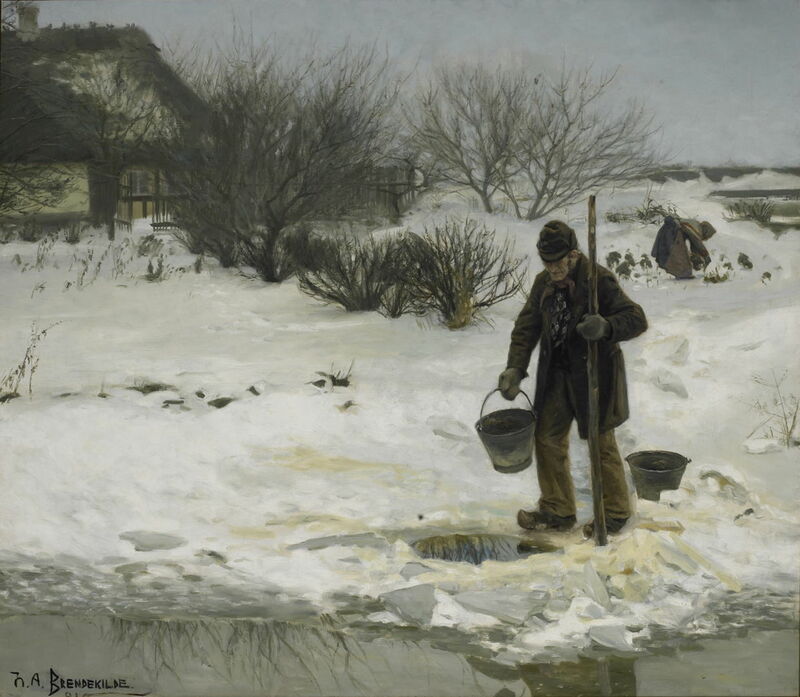 Melting Snow from 1895 is a wonderful depiction of a harsh winter in the country. An elderly couple are doing the outside jobs in typically grey and murky weather, in the backyard of their thatched smallholding. He has walked down to fetch a pail of water from a hole that he has made in the ice on the river. Walking on that ice in his wooden clogs must be cold and quite dicey. His wife meanwhile is cutting some leaves from their vegetable patch. With the snow on the ground, their food supplies must have been dangerously meagre until the thaw was complete in the Spring. Hans Andersen Brendekilde (1857–1942), Spring. 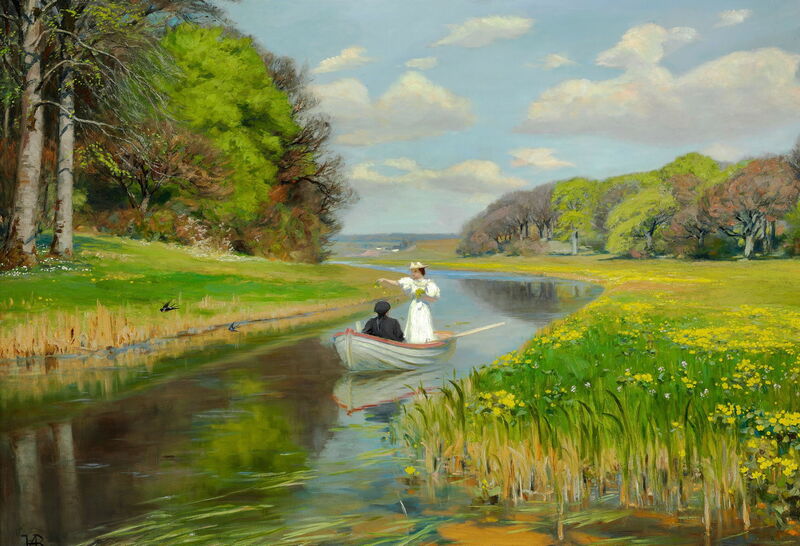 A Young Couple in a Rowing Boat on Odense Å (1896), oil on canvas, 107 x 155 cm, Private collection. Wikimedia Commons. The following year, he painted Spring. A Young Couple in a Rowing Boat on Odense Å (1896), which was exhibited at Charlottenborg in 1897. A young couple are out in the fine weather on a sleepy river near Odense. She is standing in the boat and dropping wild posies on the water. A couple of swallows fly past them, as they return from their winter in north Africa. The world is at peace, basking in the warmth of the sun. Hans Andersen Brendekilde (1857–1942), Cain gets on with his Work in the Field after Killing his Brother Abel (1896), media not known, 202 x 264 cm, Private collection. Wikimedia Commons. Brendkilde’s greatest success of this time was his Cain gets on with his Work in the Field after Killing his Brother Abel, also from 1896, which won him the Eibeschiitz Prize. This tells the story from the Old Testament book of Genesis, in which the first two sons of Adam and Eve, Abel and Cain, came into conflict. Cain was the older, and became a ’tiller of the soil’, while his younger brother Abel was a shepherd. Cain became jealous of Abel, whose offerings to the Lord were better received than Cain’s. 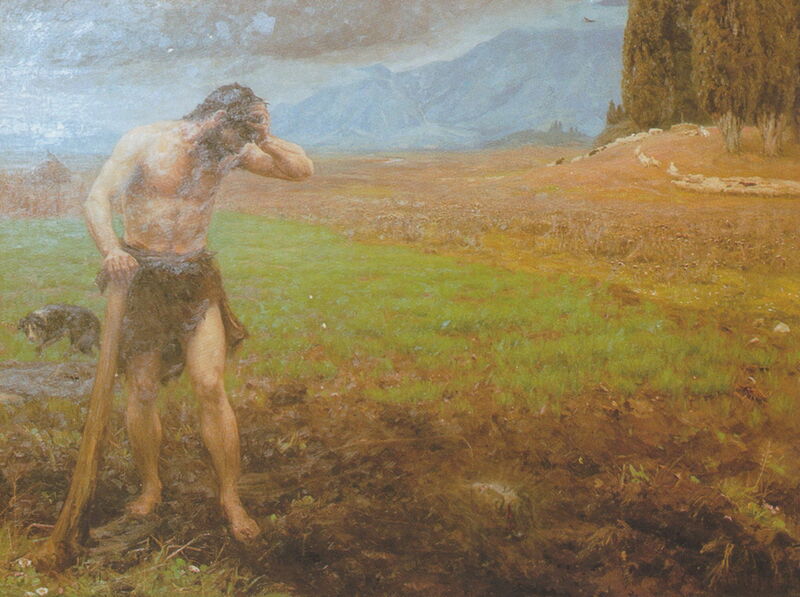 So Cain took Abel out into one of his fields, where he killed him and buried his body. Brendkilde shows Abel’s flock in the distance, with an eagle flying over them, and the shepherd’s dog pining for his master at the left. Abel’s lifeless face still looks up from his grave, as Cain stares down at him. Hans Andersen Brendekilde (1857–1942), Portrait of Laurits Andersen Ring (before 1900), oil on canvas, 47.3 x 34 cm, Fyns Kunstmuseum, Odense, Denmark. Wikimedia Commons. At some stage before 1900, Brendkilde painted this small but intense Portrait of Laurits Andersen Ring. At the end of the century, there is a gap of about five years for which I have been unable to find any accessible paintings by Brendkilde. Then, early in the twentieth century, comes this splendid Wooded Path in Autumn from 1902. As with his earlier Naturalist paintings, there is a story on this canvas, although it is perhaps intentionally open-ended, encouraging the viewer to speculate more. It is autumn on a walk beside a river. A woman, dressed in black apart from a red ostrich feather on her hat and her white gloves, sits on a rustic bench. Her head is turned to look intently at two men who are now receding into the distance along the path. The men must have walked past the woman a few minutes ago, and there is evidence in the fallen leaves of their passing. Who were they, and what relationship do they have with the woman? Hans Andersen Brendekilde (1857–1942), Two Girls with Needlework Sitting in a Farmyard (1902), oil on canvas, 49 x 60 cm, location not known. Wikimedia Commons. 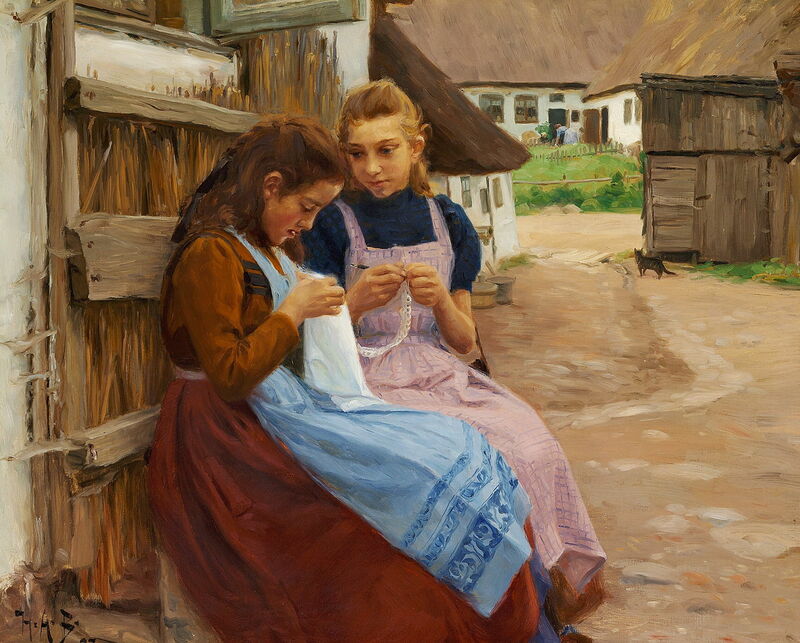 In the same year, Brendekilde painted this rather sentimental rustic scene of Two Girls with Needlework Sitting in a Farmyard (1902). These girls are a far cry from the subjects of his earlier Naturalist paintings, being clean, well-dressed, and engaged on light domestic tasks typical of the middle class. In the distance is a farmyard cat, and a woman is kneeling on a doorstep giving it a good scrub. Hans Andersen Brendekilde (1857–1942), Soap-bubbles (1906), oil on canvas, 54 x 69 cm, Private collection. Wikimedia Commons. 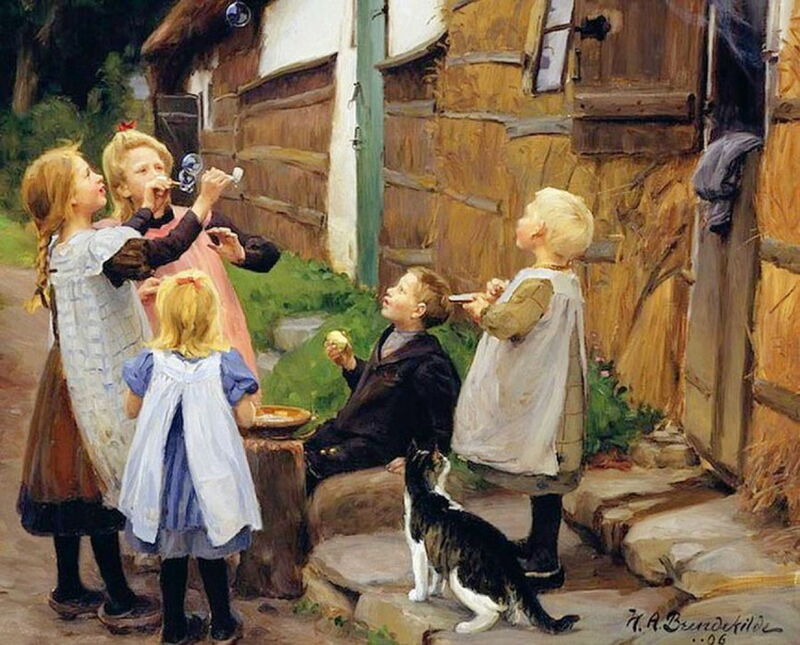 The children in Brendekilde’s 1906 painting of Soap-bubbles are a little more down to earth, although engaged in an activity which had become something of a cliché since John Everett Millais’ famous and sentimental painting of exactly twenty years earlier. Brendekilde’s brushwork has become looser, although each bubble is crafted finely. Tomorrow, I will look at a small selection of the prolific output of L A Ring over this same period. 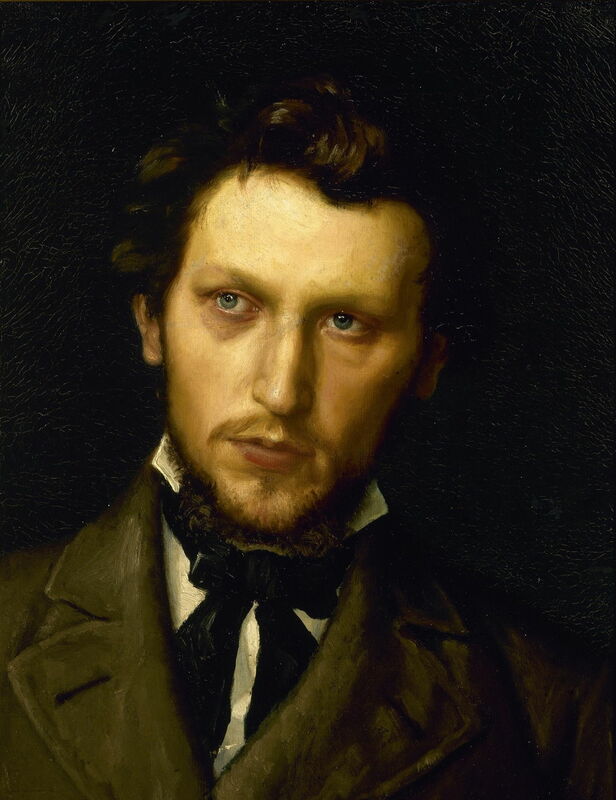 Posted in General, Life, Painting and tagged Andersen, Brendekilde, Denmark, Millais, naturalism, painting, realism, Ring. Bookmark the permalink.